Modern dentistry has changed tremendously with implant therapy. For the successful implant therapy, making a proper treatment plan considering both surgical and prosthetic part in mind is the key of success. Often practitioners tend to create a treatment plan overlooking the basic principles of prosthetic part. This present review has discussed various prosthetic consideration of implant-supported prosthesis. A step-by-step detailed prosthetic option with their indications has been discussed to help all dental implant practitioners in making of an optimal treatment plan for each case. Objective: The objective of the study was to determine the potential risk of tooth/root displacement into the soft tissue during the third molar surgery. While performing third molar surgeries, one of the many complications is displacement of the tooth into the soft tissues. This can be due perforation of the lingual cortical bone during surgery or the position of the tooth root which may be close to the lingual bone. 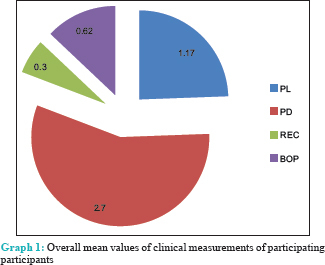 Materials and Methods: Retrospective samples of 251 patients were collected who had undergone cone-beam computed tomography (CBCT) for various reasons. Measurements were performed independently and recorded twice by one surgeon and one radiologist; the average of the two measurements was calculated and evaluated using MyRay CBCT. 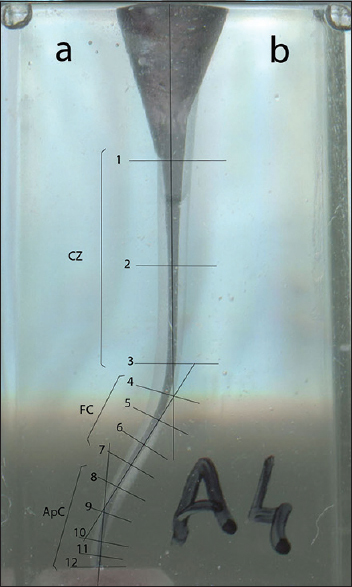 Results: On the right and the left side, the average distances in males for AL were 3.31 and 2.96 mm, respectively, whereas in females was found to be 3.98 and 3.56 mm which were statistically significant. On the right and left side, the average distances in males for RL were 2.03 and 1.78 mm, respectively, whereas in females, it was 2.41 and 1.99 mm, respectively, with the significant P value in the right side. Conclusion: Despite the sample size being of 251 patients, a large number of root of the third molar (95.62%) were not in contact with lingual cortical bone, but still practitioner should be careful during surgery as there might be the risk for displacement of the tooth. The images used were of impacted molar used in this study and these teeth were not subjected to surgery. Hence, the results can be only correlated theoretically, i.e., there would be a risk of displacement of the tooth during extraction. Objectives: The aim was to compare the shaping ability of WaveOne reciprocating files with or without glide path in simulated curved S-shaped root canals. Materials and Methods: Forty ISO #15, 0.02 taper, clear resin Endo Training Bloc-S blocks were studied. The simulated curved S-shaped canals were dyed using ink, preinstrumentation images were scanned, and resin blocks were prepared and divided into Group A: PathFile and WaveOne and Group B: WaveOne. All canals were postoperatively scanned. Pre- and postoperative images were superimposed and evaluated at 12 defined measuring points. The efficacy of the systems was compared based on the amount and direction of canal transportation, centering ability, amount of material removed, and presence of canal aberrations. Mann–Whitney U-test and independent t-test were used for statistical comparison. Results: Both systems produced transportation at all levels and straightened the curved S-shaped canals. No significant differences in the amount and direction of transportation and amount of material removed were observed between the groups at each level (P > 0.05). However, Group A had significantly greater centering ability at the coronal straight zone (P = 0.018) and apical curvature (P = 0.014) levels than did Group B. Moreover, Group B showed more canal aberrations than did Group A. Conclusion: Within the limitations of the present study, the creation of a glide path with the PathFile system improved the centering ability of the WaveOne reciprocating file in the apical and straight coronal portions of the simulated curved S-shaped root canals and reduced the incidence of canal aberrations. Aims and Objectives: The objective of the present study is to compare the effectiveness of three different processing techniques and to find out the accuracy of processing techniques through number of occlusal interferences and increase in vertical dimension after denture processing. Materials and Methods: A cross-sectional study was conducted on a sample of 18 patients indicated for complete denture fabrication was selected for the study and they were divided into three subgroups. Three processing techniques, compression molding and injection molding using prepolymerized resin and unpolymerized resin, were used to fabricate dentures for each of the groups. After processing, laboratory-remounted dentures were evaluated for number of occlusal interferences in centric and eccentric relations and change in vertical dimension through vertical pin rise in articulator. Data were analyzed using statistical test ANOVA and SPSS software version 19.0 by IBM was used. Results: Data obtained from three groups were subjected to one-way ANOVA test. After ANOVA test, results with significant variations were subjected to post hoc test. Number of occlusal interferences with compression molding technique was reported to be more in both centric and eccentric positions as compared to the two injection molding techniques with statistical significance in centric, protrusive, right lateral nonworking, and left lateral working positions (P < 0.05). Mean vertical pin rise (0.52 mm) was reported to more in compression molding technique as compared to injection molding techniques, which is statistically significant (P < 0.001). Conclusions: Within the limitations of this study, injection molding techniques exhibited less processing errors as compared to compression molding technique with statistical significance. There was no statistically significant difference in processing errors reported within two injection molding systems. Aim: The aim of this study is to assess the prevalence of temporomandibular disorders (TMDs) among university students. Objectives: The etiology of TMD is of multifactorial, and our study is designed to assess the prevalence of TMD in an institution within a university. Various parameters including trauma, malocclusion, stress assessment - its correlation with the timing, the duration of TMD in meeting the deadlines, and examinations have been assessed. Materials and Methods: A standard questionnaire-based study with modified Fonseca anamnestic index is used. 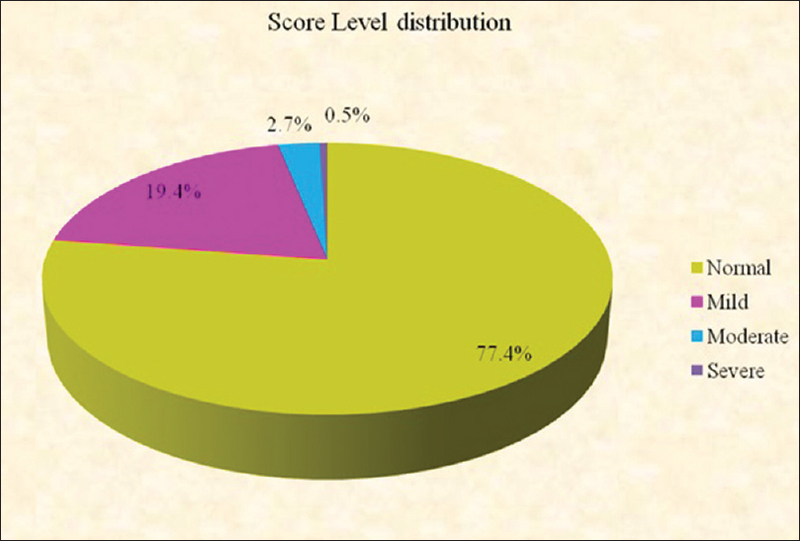 The questionnaire study was conducted with a statistically calculated sample size of 402 students within a university. The data were analyzed statistically for significance and correlations. Statistical analysis was performed using SPSS for Windows release 14.0 (SPSS Inc., Chicago, IL, USA). Differences at the 5% level were accepted as being statistically significant. Results: TMD and its associated symptoms are frequent among students of health and science studies. Female predominance is seen. There was also an increased prevalence of symptoms in people who described themselves as being tense. The relationship between orthodontic therapy and TMDs were also evaluated, and the duration of therapy is found to be significant. There was a significant association between history of trauma and presence of TMDs. Conclusions: TMD and its associated symptoms are frequent among students of health and science studies. A simple anamnestic index is of use in identifying and classifying temporomandibular joint and TMD symptoms in patients according to the severity of the disorder. Females showed a greater prevalence of signs and symptoms of TMD than males. Longitudinal studies are recommended to identify and follow-up the prevalence and health-care needs of patients with TMDs. Aim and Objectives: To assess the prevalence of the three putative periodontal pathogens such as Aggregatibacter actinomycetemcomitans (A. a), Porphyromonas gingivalis (P. g), and Prevotella intermedia (P. i) in a group of Arab participants from the Middle East and North Africa (MENA) region who had minimal periodontal disease and no history of periodontal treatment and further to analyze the association among these three microorganisms. Materials and Methods: Eighty-four participants of varied demographics and oral/dental care habits were screened for this study. Twenty-one participants who eventually gave their consent to fully participate in the study provided a balanced representation of the screened universe. Results: Seventy-eight microbiological samples were taken from the deepest pockets. Twenty-three percent of all samples were found to be A. a positive and so were 79% for P. g and 82% for P. i. A highly remarkable association was observed between the presence of P. i along with P. g (P < 0.00l; Fisher's exact test). Of all samples, merely six cases were P. i positive but not P. g and eight cases were vice versa. There was a statistically significant association between A. a and P. g (P = 0.016). No significant relationship was detected between P. i and A. a. 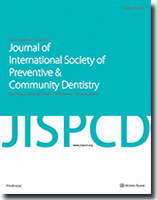 Conclusions: This qualitative study shows very high frequency of the three periodontal pathogens (A. a, P. g, and P. i) in a group of Arab nationals with minimal periodontal disease. The lack of oral hygiene, minimal use of antimicrobial drugs and antiseptics, and the absence of dental care may partly explain the high prevalence of periodontal pathogens. 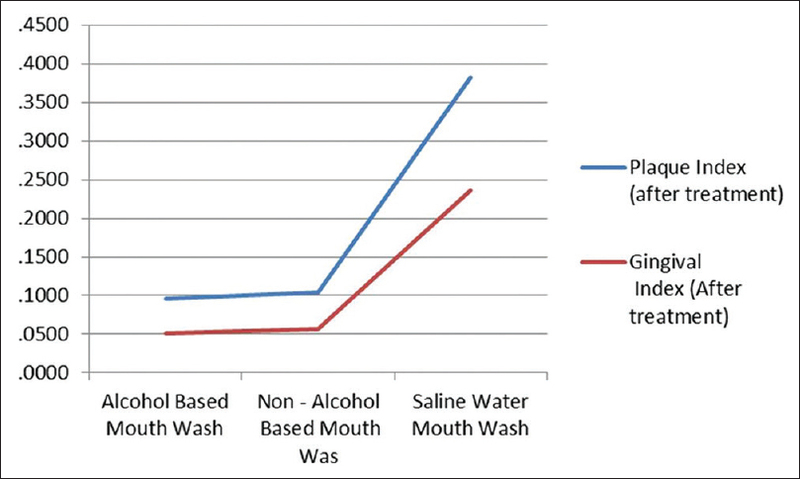 Aim and Objectives: The aim of this study is to compare the antiplaque efficacy of alcohol-based mouthwash with essential oils and nonalcohol-based chlorhexidine mouthrinse in 4 days plaque re-formation study. Materials and Methods: The current research paper is double-blinded, parallel designed clinical trial that was conducted in the Department of Periodontics and Oral Implantology, Kalinga Institute of Dental Sciences, Bhubaneswar. This included ninety dental students of Bachelor of Dental Surgery curriculum (in the age range from 20 to 24 years) Professional cleaning with scaling and polishing was carried out to acquire a zero plaque and gingival index (GI) for all ninety patients at baseline. Ninety patients were randomly divided into three groups with thirty patients in each group named as Group A, B, and C, respectively. Two commercially available mouthrinses, one containing alcohol (labeled as Solution (A) and one without alcohol (labeled as Solution (B) were placed in identical bottles and distributed to Group A and Group B patients. Whereas, the Group C patientswere instructed to use warm saline mouth rinse. The statistical analysis was performed using the Statistical Package for the Social Sciences software (Version 18). Results: Essential oils with an alcohol-based and chlorhexidine (CHX) alcohol-free mouthrinse (0.2%) groups compared to normal saline showed significant reductions in GI and PI scores. (P < 0.0001). Conclusion: The antiplaque efficacy of both alcohol-based mouthwash with essential oils and nonalcohol based CHX mouthwash were found to be equally effective in 4 days of plaque re-formation. Aims and Objectives: Predicting caries risk in children can be done by identifying caries risk factors. It is an important measure which contributes to best understanding of the cariogenic profile of the patient. Identification could be done by clinical examination and answering the questionnaire. We arrange the study to verify the questionnaire validation for predicting caries risk in children. Materials and Methods: The study was conducted on 62 pairs of mothers and their children, aged between 3 and 5 years. The questionnaire consists of 10 questions concerning mothers' attitude and knowledge about oral health. The reliability and validity test is based on Cronbach's alpha and correlation coefficient value. Results: All question are reliable (Cronbach's alpha = 0.873) and valid (Corrected item-total item correlation >0.4). Conclusions: Five questionnaires of mother's attitude about oral health and five questionnaires of mother's knowledge about oral health are reliable and valid for predicting caries risk in children. Objectives: Risk factors in oral implantology are defined as local or systemic conditions that increase failure rates. The purpose of this paper is to evaluate the long-term survival rate of dental implants placed in patients presenting mechanical risk factors. 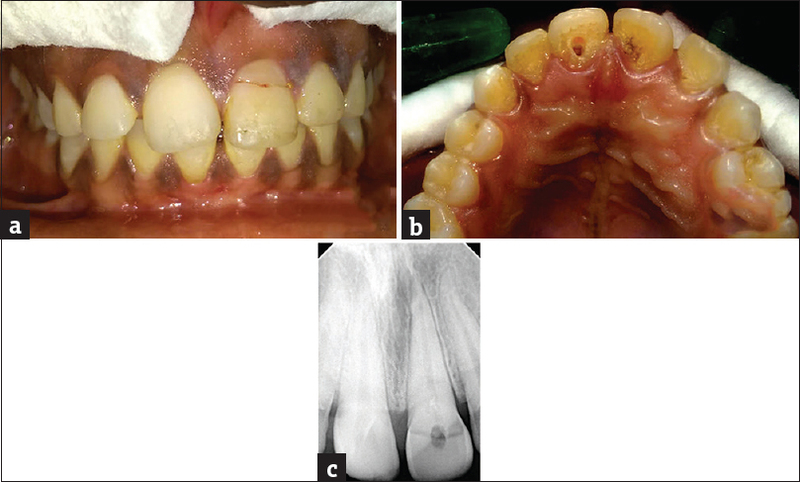 Materials and Methods: This retrospective study was conducted only with patients presenting at least one of the following risk factors were included: Bruxism; crown-to-implant (C/I) ratio <0.8; abutment angulation. The overall implant survival was estimated using Kaplan–Meier analyses. Risk factors for implant failure were identified using the Cox proportional hazard regression models. Results: Eighty-nine eligible patients were enrolled in this study: They were both male (n = 56, 62.92%) and female (n = 33, 37.08%), with an average age of 53.24 (23–76 years), with 227 dental implants inserted. The mean follow-up was 13.6 years (range: 10–16 years). The overall 10-year Kaplan–Meier survival estimate with associated 95% confidence intervals was 86.34% (82.8, 87.1). Bruxism was the only variable that showed a statistically significant association with implant failure (P < 0.05) and a hazard ratio of 2.9, while both Crown to-implant and abutment angulations reported lower values of failure (P > 0.05). Conclusions: Within the limitations of this study, can be concluded that data suggested an evident relationship between bruxism and dental implant failure but further studies, with a larger sample and a different design are required to assess this relationship. Traumatized anterior teeth require quick functional and esthetic repair. Tooth fragment reattachment is a simple and conservative clinical procedure to restore fractured anterior teeth. Different techniques of reattachment include enamel beveling, “v-” shaped internal enamel and dentin grooves, external chamfer, over contouring, and by placing fiber post, all of which were invasive methods. This article describes a novel technique of reattachment using canal projectors for stabilizing fractured fragments followed by endodontic therapy and internal reinforcement with custom fiber post (everStick Post™, GC Corporation, Tokyo, Japan).